Welcome to www.handgards.com! We take immense pride in being a valued, innovative resource for our customers. That, matched with our unsurpassed experience with food service has made us the industry leader in food safety innovation. 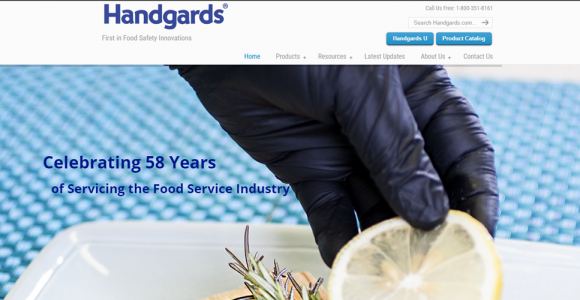 With over 58 years of servicing the food service industry, Handgards knows and understands what works and what doesn’t. We understand that your investment should bring you quality, reliability and all the benefits of the very latest advances. We are excited to share with you our newly revamped Handgards website. All of the core content that you have come to rely and depend on is still there, just enhanced and perfected to provide you a top notch experience. A more user friendly platform allows for ease of mobility throughout the new site. Just as we are committed to the quality of the products we produce, we are just as committed to providing our customers with value-added technology that allows them to find what they need when they need it. We hope you enjoy the new site!